Jenkinson’s ships sailed on into the White Sea, which they referred to as the Bay of St. Nicholas, and on 12th July 1557 all four of the ships, “arrived in safetie at the road of Saint Nicholas in the land of Russia”. They had done well, despite going aground three times in the first two weeks. They had sailed 750 leagues, about 2,250 sea miles, in two months, at an average speed of about 1½ knots, without any loss. Ossip Napeja was delighted to be home: “The Russian ambassador and his company with great joy got to shore”. They had arrived at St Nicholas, an abbey at the southernmost mouth of the delta of the great North Dvina River, where it discharges into the White Sea. [Archangelsk, the port and city, was established some years later, 21 miles (35 km) away, on the north side of the estuary of the Dvina]. The first English vessel to reach Russia, the Edward Bonaventura, under Richard Chancellor and Stephen Borough, had put ashore at St Nicholas in 1553 and had established a shore base there on an island they called Rose Island (now called Yagry Island). Hundreds of years later, in the 20th century, St. Nicholas was developed into the city of Sverodvinsk. This was done in tremendous secrecy and the city was not shown on any navigational chart. It became one of the Soviet Union’s great submarine bases and also the base port for the two Russian nuclear testing grounds on Novya Zembla. Ossip Napeja spent six days seeing to the unloading of all his belongings and numerous gifts destined for the Tsar and loading them all into nassadas and drosneckes. These are flat-bottomed river barges that can carry up to 200 tons apiece, and are hauled by men with ropes, or pushed with poles. The four English ships at St Nicholas started reloading straight away, and they set off back to England on 1st August, without Jenkinson. Ossip Napeja, the Ambassador, and his party, which included Dr Standish and Mr Grey, reached Colmogro in four days, where he received a great welcome. He, “had presents innumerable sent unto him, but it was nothing but meate and drinke. Some sent white bread, some rie bread, and some buttered bread and pancakes, beefe, mutton, bacon, egges, butter, fishes, swannes, geese, duckes, hennes and all maner of victuals, both fish and flesh, in the best maner, that the rude people could devise”. His party eventually left Colmogro after five days, and travelled on up the Dvina River to his home town of Vologda, which took 30 days, where they unloaded all their goods into carts (called telegos) and continued their journey overland, another 310 miles (500 km) or so to Moscow. This took another 14 days, so that it was 12th September before they reached Moscow. In Moscow, the party were taken by Ossip Nepeja and two of the Tsar’s gentlemen, to a large house, where each of them found a room ready and waiting for them. Meanwhile, Jenkinson stayed on at St. Nicholas until the end of July, to supervise the Company business there, before he too set off, with a few others, up the River Dvina to Colmogro, where he stayed for 12 days. The Muscovy Company had established a rope works and a ‘factory’ or trading station there. A factory in this sense is an establishment where a factor or agent transacts business for an employer. Colmogro was a great mart for many of the northern districts of Russia, where Lapps, Samoyeds, Karelians, Russians and Tatars all came to trade in fish, fur, feathers and oil. The English factory at Colmogro flourished. An English visitor there commented in 1568 that, “The English have lands of their own given them by the Emperor and many fair houses with offices for their company, built all of wood”. Jenkinson travelled on, up the Dvina in a small boat, to Vologda, to start the next stage of his adventures. He describes the river and its tributaries as he went along, and the forest and the few towns. For instance, “At this citie (Ustiug) meete two rivers: the one called Iug and the other Sucana, both which fall into the aforesaid river of Dwina. The river of Iug hath his spring in the land of the Tartars called Cheremizzi, ioyning to the country of Permia: and the Sucana hath his head from a lake not farre from the citie of Vologhda”. The sheer size of Russia is daunting. The distances involved were tremendous, certainly by English standards. Jenkinson travelled from Colmogro to Vologhda by river for about 1,000 versts (more than 1,130 km) and it took him 37 days. That is roughly 20 miles a day (32 km), travelling against the current, which was swift in places. “All the way I never came in house, but lodged in the wildernesse, by the rivers side, and caried provision for the way. And he that will travell those wayes, must carie with him an hatchet, a tinder boxe, and a kettle, to make fire and seethe meate, when he hath it: or there is small succour in those parts, unless it be in townes”. He relied on his kettle, his axe and his tinderbox. His experience must have been somewhat similar to that of the French voyageurs in Canada in the 17th century, when they explored the great rivers and lakes of the northwest in their birch bark canoes in search of furs: endless forests, never quite knowing what might be lurking in the trees. Eventually, Jenkinson reached Vologda, which he described as a great city. The houses there were built entirely of wood, and the roofs were covered in earth as a precaution against fire. He took the latitudes of Colmogro and of Vologda, both of which were accurate to within half a degree. 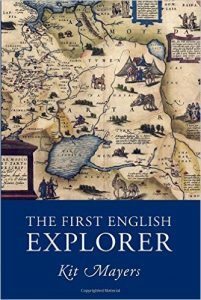 By this time it was winter, the best season for overland travel, so he rode in a sled from Vologhda to Moscow, about 298 miles (480 km), arriving there on 6th December 1557. Jenkinson describes sled riding as follows: “In his sled he sits upon a carpet, or a white Beares skinne: the sled is drawn with a horse well decked, with many Foxes and Woolves tailes at his necke, & and is conducted by a little boy upon his backe: his servants stand upon the taile of the sled”. 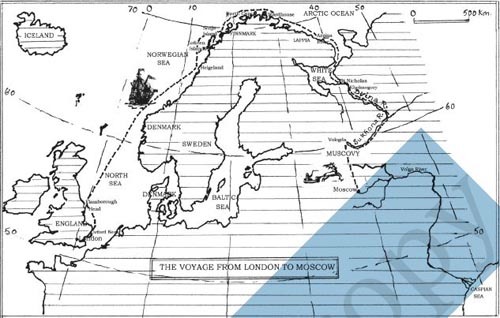 Since leaving Gravesend, he had been travelling for just short of seven months when he eventually reached Moscow. Jenkinson stayed in Moscow all through the winter until the 23rd of April 1558, but he says nothing about where he lived during that time. He very probably stayed in the first Muscovy Company house in Moscow. This was both a house and a trading station or factory. It was in the foreign (or German) quarter, in the Kitai-Gorod district, more or less where the Nikolskaya Ulitsa is today. It was later burnt down, in 1571, when nearly all of Moscow was burned to the ground in a raid by the Tatars, with enormous loss of life. The fire destroyed Moscow so completely that it was reported that, “not a post was left to which a horse could be fastened”. All the houses outside the Kremlin were built of wood, and they were destroyed. However, the tall brick walls of the Kremlin and most of the stone-built palaces and churches inside the walls survived, and they can be seen to this day. Four days after his arrival, he was sent for, to ‘the Emperor’s Castle’, where he delivered his letters to the Emperor’s Secretary. The Secretary was Ivan Michailovitch Viscovatof, according to Killingworth’s account. On the 25th December, the day of the Nativity, he was summoned to dine with the Emperor, together with some 600 others in a great hall. The hall was the Granovitaya Palata, where distinguished foreigners and ambassadors were received and entertained at great feasts. It had been designed by two Italian architects and built in the 15th century by Ivan III.65 A further 2,000 people dined in another adjacent hall. Jenkinson found that he was singled out for special attention: he had to sit at a little table all by himself, directly in front of the Emperor, surrounded by the 600 members of the his court. “Being thus set and placed, the Emperor sent me divers bowles of wine, and meade, and many dishes of meat from his own hand, which were brought me by a Duke, and my table served all in gold and silver, and so likewise on other tables there were set bowles of gold, set with stone, worth by estimation 400 pounds sterling one cup, beside the plate which served the tables …. and when the dinner was ended, the Emperour called me by name, & gave me drinke with his own hand, & so I departed to my lodging”. Jenkinson does not appear to have been fazed by having to sit all alone in front of 600 Russian princes, nobles and boyars. He was very impressed by all the gold and silver vessels, the garments and the many other rich trappings of the Russian court. 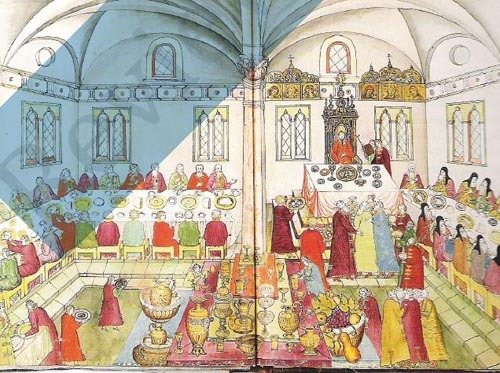 Many of the valuable items he saw at the Tsar’s court are now displayed in The Armoury in the Moscow Kremlin, including Ivan IV’s ivory throne and a Gospel with a gold cover embedded with various gems and pearls. On the 4th January, Jenkinson witnessed the ceremony of the Blessing of the Water by the Metropolitan (the head of the Orthodox Church in Russia), which he described at some length. The whole court and many of the people of Moscow went down onto the icecovered Moscow River, where a hole was made in the ice and some of the water sprinkled on everybody, and some on the Emperor’s horses, and a number of children and sick people were immersed in the water and brought out again.68 Among other comments, Jenkinson noted that the Emperor, “keepeth his people in great subjection: all matters pass his judgement, be they never so small. The lawe is sharpe for all offenders”. Jenkinson began to learn what Russia was like and he soon found out that this Emperor was Tsar Ivan IV, who later earned the epithet ‘the Terrible’. Tsar Ivan IV was called Ivan Grosny, which means ‘to be feared’ or even ‘terrified of’, which was certainly true of him in the second half of his life. Ivan IV was reportedly Stalin’s favourite Tsar. When Jenkinson first met him, he was a powerful autocrat, an absolute ruler, whose word was law throughout Russia. Richard Chancellor and Stephen Borough had noticed this when they first arrived at St. Nicholas in 1553. They found that the local people there were willing to give them food, but that they dare not sell them any food or do any kind of trade with them until they had received permission to do so from Moscow, over a thousand miles away. Jenkinson also noted that, “They have many sortes of meates and drinkes when they banket, and delight in eating grosse meates and stinking fishe… They are great talkers, & liers, without any faith or trust in their words, flatterers and dissemblers”. He commented on drunkenness, and said he had heard of, “men and women, that drunke away their children, and all their goods”. He was already learning about Russia, though his initiation into Russian life had only just begun.